The name aquamarine finds its origins from the Latin for seawater. Antique and vintage aquamarine jewelry is sought after as the birthstone of March and is said to bring more happiness to a marriage – it is also the gem of the 19th wedding anniversary. It comes from the Beryl family and according to the Gemological Institute of America, the mineral beryl gives the wearer protection against foes in battle or litigation. It’s an interesting allegory, the aquamarine is a delicate light blue and the crystal is transparent and reminds you of the whimsical sea, and not a gloomy battle field. 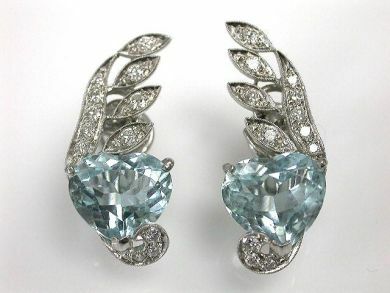 At Cynthia Findlay Antiques there is a wide selection of aquamarines; from antique aquamarine filigree pendants, to vintage aquamarine and diamond art deco rings, to vintage earrings, vintage bracelets and antique brooches. The most unique pieces include this stunning platinum and 18kt necklace. It is a yellow gold necklace, featuring one oval facetted medium intense blue aquamarine, nine old European cut diamonds, and one hundred and fifteen rose cut diamonds. There are twelve creamy white cultured pearls and the platinum clasp is set with two diamonds. The four strands of cultured silvery rose pearls make up the rest of the piece which is sixteen inches in length. This 1930’s art deco aquamarine brooch is also a superb example of the unique pieces held at Cynthia Findlay Antiques. It has a large 35.1 carat briolette cut aquamarine. 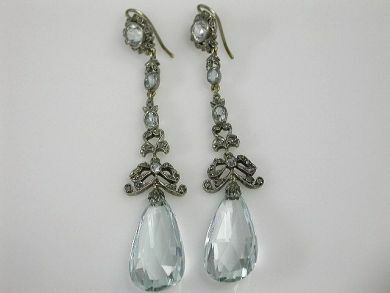 It is a stunning light sky blue in colour and set in 18kt. The twenty-four single cut and four baguette cut diamonds which are 0.50 carats, and fourteen calibre cut synthetic sapphires, set off the colour and cut of the aquamarine. 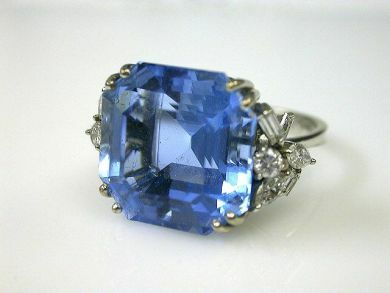 The aquamarine can be cut into most shapes, but the popular fashions are emerald cuts, round and oval brilliants. It is the hardness of the gemstone and the beauty of its transparency that have made it popular with age-old sculptors, designers and artists. These Victorian earrings made of 18 karat yellow gold and a silver top have two briolette aquamarines and are accented with eight aquamarines of 3.05 carats and sixty diamonds at 0.25 carats. Another stunning example of antique and vintage aquamarine jewelry is this pair of platinum and 14 Karat white gold wing like earrings with two heart-shaped aquamarines of 14.43 carats, surrounded by twenty four brilliant cut diamonds of 0.65 carats VS clarity. One of the things Cynthia Findlay Antiques is known for is the wide selection of estate aquamarine rings, and this beautiful 18 karat white gold ring, circa 1940 houses a 24.1 carat aquamarine accented with twelve round brilliant, straight baguette and marquise brilliant cut diamonds of 1 carat and VS clarity. Visit our antique and vintage aquamarine jewelry under the jewellery top category to view more unique aquamarine pieces or call into the shop for more information.